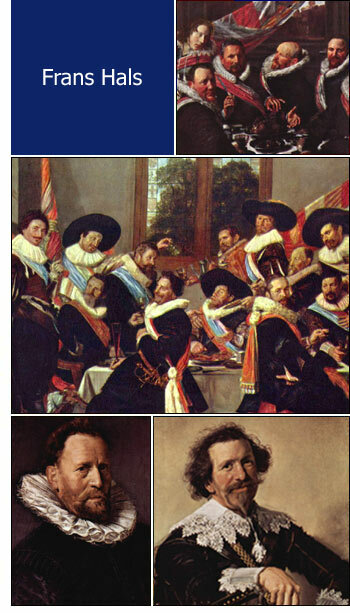 Frans Hals belonged to a family which for two hundred years had been highly respected in Haarlem in the Netherlands. The father of the painter left that town for political reasons in 1579, and it was at Antwerp that Frans was born sometime between that date and 1585. His parents took him back to Haarlem as an infant, and that is the town with which his name and fame are most closely associated. Little is known of his early life except that he began his studies with Karel Van Mander and Cornelis Cornelissen. What we know of his family life is not to his credit. In the parish register of 1611 is recorded the birth of a son to Frans Hals and five years later he is on the public records for abusing his wife, who died shortly afterward. He married again within a year and the second wife bore him many children and survived him ten years. Five of his seven sons became painters. Frans Hals drank too much and mixed too freely with the kind of disreputable people he loved to paint, but he never became so degraded that his hand lost its cunning, or his eye its keen vision for that which he wished to portray. In 1644, he was made a director of the Guild of St. Lucas, an institution for the protection of arts and crafts in Haarlem, but from that time onward he sank in popular esteem, deservedly. He fell into debt, then into pauperism, and when he died, about the age of 86, he was buried at public expense in the choir of St. Bavon Church in Haarlem. It was in the year 1616 that Hals first became known as a master of his art by the painting of the St. Jovis Shooting Company, one of the clubs composed of volunteers banded together for the defence of the town should occasion arise. Such guilds were common throughout Holland, and they became a favourite subject with Hals, as with other painters of the time, who vied with one another in portraiture of the different members. These groups were hung upon the walls of the chambers where meetings were held for social purposes in times of peace. The men of highest rank are always given the most conspicuous places in the pictures. The flag is generally the one bit of gorgeous colour in the scene; but Frans Hals seized the opportunity to show his wonderful skill in detail while painting the cuffs and ruffs worn by these grandees. In all his work there is an impression of strength rather than of beauty; it is the charm of expressiveness he is aiming at, rather than the charm of grace and colour to which the Italian school was devoted. He differed from that school, also, in his choice of subjects, for he was distinctly and almost entirely a portrait painter, and within his own limited range he is unsurpassed. A wonderful collection of his works is to be seen in the Haarlem Town Hall. Considering the woeful life that Frans Hals led, it is amazing to think that he of all artists is the best painter of good humour. He puts a smile on the face of nearly every one of his "leading characters," whether it be a modest young girl, a hideous old woman, a strolling musician, or a riotous soldier, and in every case the laugh suits the subject. It may have been his own easygoing shiftlessness, his way of casting care aside with a jest that enabled him to live so long and to accomplish so much in spite of his poverty and other misfortunes. The roguish look upon the face of this baby of the house of Ilpenstein makes it appear older than the pleasant faced nurse. The dress of the child is such as Hals delighted to spend his talents upon. The picture is in the Berlin Gallery. Among his best known paintings are "The Laughing Cavalier," "The Fool," "The Man with the Sword," and "Hille Bobbe. the Witch of Haarlem." Frans Hals lived from 1580 to 1666 and was a pupil of Karel van Mander.